The metrosexual clean-shaven look has given way to the rugged, masculine, and bearded look of the 21st century. A beard is one of the most prominent symbols denoting a man’s personality and the latest trend seems to be favoring its growth. This has had a direct impact on the global shavers market. Famous celebrities and athletes have been photographed sporting a full beard and this has further boosted the appeal of the human ‘mane’. A survey conducted by USA Today Sports in the year 2015 showed that almost half the players in baseball clubs in the country sported some form of facial hair. The sales of disposable razors has been plummeting drastically across the developed world mainly because people in these regions either opt for an electric razor or go in for the ‘full beard’ look. Furthermore, consumers are adopting environmentally-friendly practices such as minimizing the use of disposable razors blades. An independent study conducted some years ago stated that almost 80 million American men used plastic disposable razors that were responsible for approx. 35 million cubic feet of toxic waste every year. The vast majority of this waste is non-recyclable and is either dumped into the ocean or used in landfills. That is why customers are flocking to electric options in the shavers market that should help the global electric shavers market be worth more than US$ 14 billion in 2017 alone. The advancements in electric razor technology have made them extremely convenient and efficient to use, driving the demand for the regional electric shavers market. Hybrid razors that are a unique combination of a trimmer and razor offer additional utility and are being eagerly accepted by average customers. Consumers are also opting for electric shavers with lithium ion technology. Foil shavers provide a closer shave and are perfectly designed for hair removal along tricky contours as opposed to traditional shavers available in the shavers market. In addition, foil shavers are easier on the skin, making them popular among consumers in the shavers market. Consumers across the world are often not aware of the existence of electric razors in the global shavers market. This particularly holds true for customers above the age of 35 years who have used conventional blades and razors for decades. Thus, their acceptance of electric shavers is quite low, posing a challenge to the growth of the electric shavers market. The use of electric shavers necessitates these consumers to shift away from their long-held habits that is often easier said than actually done. People rarely wish to move out of their so-called comfort zone that is conventional razors in this case. Customers often feel that electric shavers do not offer any additional value over conventional razors in the global shavers market, hampering their sales prospects. The APAC region accounts for the largest contribution to the global electric shavers market and is anticipated to record a CAGR of 4.5% during the forecast period. 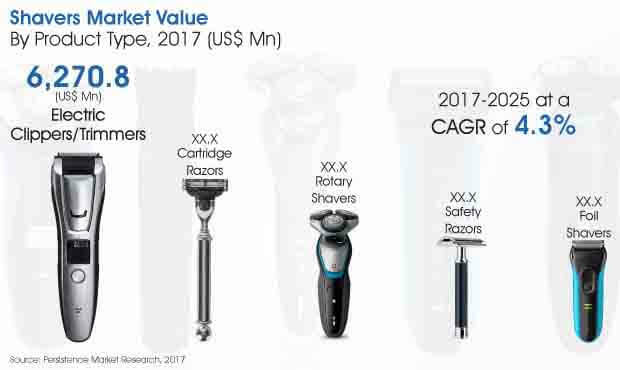 The APAC electric shaver market is predicted to cross a value of more than US$ 2.2 billion by end 2025, making it a huge opportunity key stakeholders in the global shavers market can scarcely ignore.